The Best TEFL blogs from thousands of top TEFL blogs in our index using search and social metrics. Data will be refreshed once a week. TEFL newsletter is a comprehensive summary of the day's most important blog posts and news articles from the best TEFL websites on the web, and delivered to your email inbox each morning. To subscribe, simply provide us with your email address. About Blog EFL Magazine was born out of the idea of bringing truly great content from the best people to English language teachers worldwide, to improve the lives of those teachers and their students. Facebook fans 5,083. Twitter followers 2,244. About Blog Most highly accredited TEFL courses in the UK! Over 30 UK course locations and online courses you can study from anywhere in the world. Facebook fans 17,982. Twitter followers 5,309. About Blog A useful, practical, fun, friendly meeting place where ESL/EFL teachers can share ideas and materials—that’s my vision for this website. Facebook fans 12,034. Twitter followers n/a. Sacramento, CA About Blog Larry Ferlazzo talks about websites that will help you teach ELL, ESL and EFL. I teach English, Social Studies and International Baccalaureate classes to English Language Learners and mainstream students at Luther Burbank High School in Sacramento. Facebook fans n/a. Twitter followers 66,159. About Blog Questions, answers, teaching materials, everything related to teaching English as a Foreign language goes here. H? Chí Minh, Vi?t Nam About Blog TEFL tips, ideas and thoughts from a developing teacher. Facebook fans 3,176. Twitter followers 1,080. About Blog ESLarticle.com is an article database dedicated to teaching articles for the ESL/EFL/TEFL English language teaching community. Facebook fans 2,126. Twitter followers 2,215. Vietnam About Blog Welcome to the best online TEFL magazine, get advice on where to teach, how to get TEFL qualified and start teaching abroad! Facebook fans 576. Twitter followers 960. About Blog A subreddit for discussion lesson planning and other activities in our TEFL classrooms and other TEFL teaching related activities. About Blog Anything related to teaching English or language teaching in general. North Bay, Ontario, Canada About Blog David Deubelbeiss is a professor, teacher trainer, author, ed tech advocate. Facebook fans n/a. Twitter followers 2,428. About Blog Classroom activities and thoughts from Andalucía. A site for EFL teachers to pick up ideas and activities to use in their classroom. Facebook fans n/a. Twitter followers 40,596. About Blog Teach English in China to young learner and adults students. ESL teaching jobs in China at all the major cities. Facebook fans 4,165. Twitter followers n/a. UK About Blog TESOL-direct is a leading UK-based provider of high quality TESOL/TEFL courses accredited by ACCREDITAT. Teach English to speakers of other languages. Highly accredited distance TESOL courses. Teaching business English & teaching English to young learners. Facebook fans 240. Twitter followers 1,968. Bydgoszcz, Poland About Blog Technologically and linguistically adventurous EFL teacher, trainer, writer and manager. Facebook fans n/a. Twitter followers 7,421. About Blog 8 years serving the ESL EFL TESOL Community. Offering the ESL TEFL TESOL community the latest ESL EFL TESOL Jobs, Resumes, Discussion Forums, Teacher Training Courses, Teaching News and more. Facebook fans 1,405. Twitter followers 3,163. About Blog For equal employment opportunities for native and non-native english speakers in ELT. Facebook fans 5,150. Twitter followers 2,223. Australia About Blog A Journey in TEFL is a blog where I share lessons and ideas on teaching English . Eva Buyuksimkesyan is an EFL teacher, founder of Dream2Edu, a small business which holds creative writing and reading workshops for kids, a teacher trainer and a blogger. Facebook fans 109. Twitter followers 40,596. Kitakyushu, Japan About Blog I’m an English teacher currently living in Kitakyushu, Japan. I’ve taught English as a Second or Foreign Language (ESL/EFL) for a little more than 20 years, and in those years I have taught all ages in many different environments. Facebook fans 10,994. Twitter followers 10,895. About Blog English language teacher, teacher trainer, online tutor, writer and blogger. Mostly tweeting about teaching, ELT in particular, and related bits and pieces. Facebook fans 2,526. Twitter followers 2,926. Madrid, Spain About Blog TtMadrid was started by a team of qualified TEFL teachers and TEFL trainers with extensive experience in the field. We are dedicated to providing quality TEFL teacher training, ensuring our trainees have full support and guidance both during their TEFL course here in Madrid, Spain and after the course. Facebook fans 4,186. Twitter followers 1,721. A Coruña, Galicia About Blog I started the blog because I love to write in my spare time, and share my knowledge about how much fun TEFL teaching can really be! I also give lots of tips and tricks about the Cambridge exams and how to effectively prepare your learners to pass! Facebook fans n/a. Twitter followers 535. Brasília, Distrito Federal About Blog Ideas and Opinions on Teaching English As A Foreign Language. Facebook fans 2,778. Twitter followers 7,156. About Blog Share ideas about learning English as a second or foreign language. Study abroad, ESL programs, accent reduction, ESL study Tips . . . Anything related to learning English and cultural understading! Washington, DC About Blog Thoughts, tips and anecdotes from a public school ESOL teacher. During my career, I have taught grades K-8, with most of that time spent working with grades 4-8. Facebook fans 3,547. Twitter followers 604. United Kingdom About Blog EFL advice, tricks and tips for newbie teachers. The Best Ticher is a space to share lesson ideas, thoughts, and experiences, as well as to connect with other EFL teachers as we journey through the weird and wonderful world of TEFL teaching. Facebook fans 153. Twitter followers 419. Facebook fans n/a. Twitter followers 4,487. Tokyo, Japan About Blog I’m an EFL teacher and I have been one for over 10 years. I have a Specialist degree in TEFL from Moscow City Pedagogical University. Facebook fans n/a. Twitter followers 3,795. Melbourne About Blog I worked for a variety of schools I have completed a Master of Education (TESOL) program and Bachelor of Teaching. Facebook fans n/a. Twitter followers 779. Athens, Greece About Blog For developing EFL/ESL teachers. Facebook fans 59. Twitter followers 527. Leeds About Blog I am an ESOL teacher and occasional teacher trainer from the UK. I am interested in teaching, obviously, but in particular in language teaching, teaching with technology, professional development for teachers and in professionalism in the lifelong learning sector generally. Facebook fans n/a. Twitter followers 1,469. Bydgoszcz,Poland About Blog I am an experienced EFL teacher and have given language training in the United Kingdom, Spain and Poland. Facebook fans 4,703. Twitter followers 6,228. Perth, Western Australia About Blog I’m Clare Harris, ESL teacher and writer, and a huge admirer of anyone who manages to learn a new language as an adult . About Blog The primary goal of this blog is to provide a free and useful resource for students, to engage with independent language study out of class time. Andalucia, Spain About Blog I am into the third stage of my TEFL career now, 7-19 years, where the DUST I've created is turning into STARS. On this site you can find some ways to stop that DUST settling in the classroom that i have collected from web pages and other people. Facebook fans n/a. Twitter followers 2,027. About Blog I want it to be a place for freelance EFL/ESL teachers to share activities, ideas and resources for their professional development. Tokyo About Blog I’m an EFL lecturer based in Tokyo, Japan. This site is meant to be a collection of thoughts, ideas, and resources regarding English teaching and corpus linguistics. There may be some other material about technology and language teaching in general that gets mixed in, too. Facebook fans n/a. Twitter followers 56. About Blog Articles related to ESOL by Dr Krisztina Domjan. About Blog Reflective notes, practical tips, and sample lesson plans. About Blog A blog for Advanced ESL students at the EOC. About Blog I am a Linguist, EFL teacher, Educational Researcher, and Environmental Educator. A blog about current theory about EFL teaching, Applied Linguistics, Teacher Training, Methods and Techniques, TESOL. 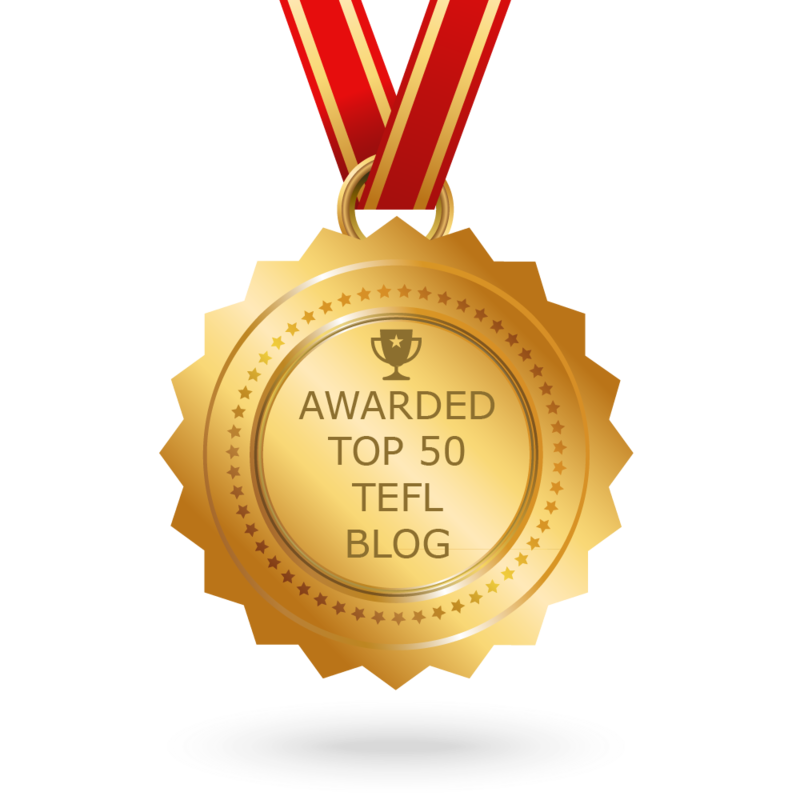 CONGRATULATIONS to every blogger that has made this Top TEFL Blogs list. This is the most comprehensive list of best TEFL blogs on the internet and I’m honoured to have you as part of this! I personally give you a high-five and want to thank you for your contribution to this world.